Since point-of-care ultrasound systems were originally designed for dealing with emergencies in a battlefield setting, it's not surprising that ultrasound now plays a pivotal role in emergency vehicles around the world. Dr Ramón de Elías Hernandez, head of on-call doctors at SAMUR, Madrid’s municipal emergency service, describes the advantages that point-of-care ultrasound brings to his everyday life. "I've been an ambulance doctor for the Servicio de Asistencia Municipal de Urgencia y Rescate (SAMUR) in Madrid for 20 years, 10 of those as head of on-call doctors. My day job is to attend patients, almost always healthy people who are just walking along the street and have an accident or are taken ill. At any time, there are two on-call doctors covering the city and going where they are most needed, usually for cases with more medical or organisational complexity. 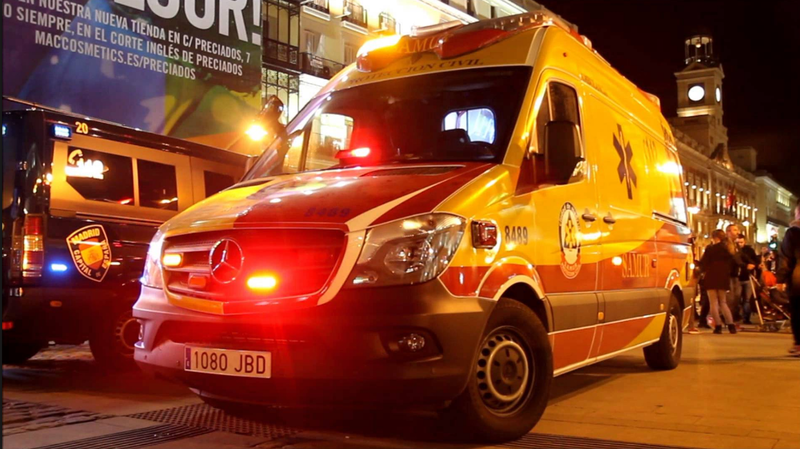 "Every day, SAMUR has around 50 ambulances and all-terrain vehicles on stand-by, based at waiting centres in each of the 21 areas of Madrid, with up to 15 of these accompanied by a doctor. Ambulance crews are dispatched according to the seriousness of the incident, or geographical proximity, and operate under a ‘two-step’ system, where those first on the scene can assess the situation and request assistance from other teams if necessary. About 15 years ago, standard procedures were established for the different pathologies we encounter, including basic guidelines for diagnosis and treatment, which drugs to use and where to take the patient, etc. These procedures now include ultrasound, recommending when and how to use it and, for the last 10 years, we have held in-house training and annual refresher courses for all our doctors. All the vehicles are fully equipped with analytical equipment, including Sonosite point-of-care ultrasound systems, used constantly in a range of situations. "Whatever the emergency, response time is very important, for example, for serious traffic accidents where responding within six or seven minutes gives the teams a greater chance of stabilising patients before injuries have progressed too far. Using ultrasound in this situation, particularly for thoracic and abdominal trauma, helps to gain even more time for critically injured patients. The FAST protocol rules out or confirms haemothorax, pericardial haemorrhaging and blood in the abdominal cavity, and dictates the next move. We can notify the hospitals about the condition of patients with serious multiple injuries, and radio ahead when they are unstable, demonstrating signs of bleeding and haemodynamic instability, so that they can be rushed directly to surgery. Of course, we still have the more traditional techniques of normal examination – touching, feeling and auscultation – but ultrasound lets us see without a doubt what’s happening, and we use it not only for diagnosis but also to prevent complications, such as using M-mode to detect an underlying hidden pneumothorax. Another of the many possibilities that ultrasound gives us now in out-of-hospital medicine is guiding central or peripheral venous catheterisation, which is an important procedure that we perform on many patients. For cardiorespiratory arrest too, ultrasound has become increasingly important; we can see perfectly whether a heart is contracting properly or has stopped completely, and can direct cardiac massage and monitor pulses far more effectively in a cardiac arrest situation. Our protocol also includes performing cardiac ultrasound to rule out pericardial haemorrhaging prior to fibrinolysis in the case of acute myocardial infarction. "Having point-of-care ultrasound available in our ambulances is a great advantage, helping us to diagnose and treat patients in complicated circumstances, and it has a knock-on effect on our patients too; it is a non-invasive, harmless technology that gives both patients and doctors more confidence in a stressful situation. It is also very cost effective as, after the initial investment, no further costs are incurred. The SonoSite systems we have are tough and ideal for difficult environments, where sometimes the systems are left on the ground – even out in the rain – or get knocked around, and yet all the systems we bought several years ago are still working perfectly. The instruments themselves are easy to handle, getting better all the time, and I fully expect to see more of them in many healthcare environments, not only for emergency care." Emergency services teams need reliable tools to help patients under some of the most traumatic conditions imaginable. For more than a decade, first responders have used SonoSite’s lightweight, dependable ultrasound systems for triage and point-of-care diagnosis in urgent situations. Learn more about the range of customized products SonoSite can provide for emergency medicine services.